Mary is called blessed by all generations, but she reminds each generation to believe they are blessed. Yes, Mary is a good mother and a good teacher. 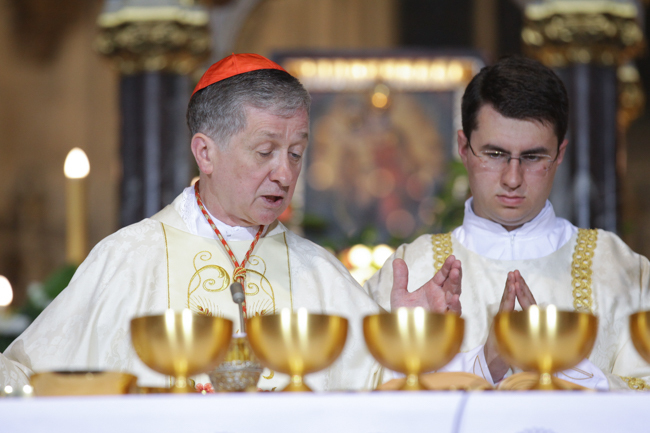 It is up to us to learn this from her, said Metropolitan Archbishop of Chicago and Cardinal Blase Joseph Cupich on Wednesday, 31 May 2017 while celebrating the Mass on the Feast of Our Lady of the Stone Gate. 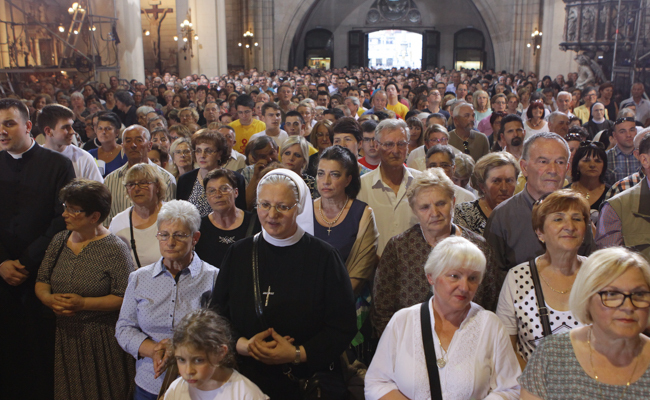 Just before the start of the Mass, which has been celebrated for the last twenty –six years in honour of the patron saint of Zagreb, Archbishop of Zagreb and Cardinal Josip Bozanić said that we have gathered before the miraculous image of Our Lady of the Stone Gate to pray for us and our needs, our Church, our Homeland and our Croatian people, and our families in particular. 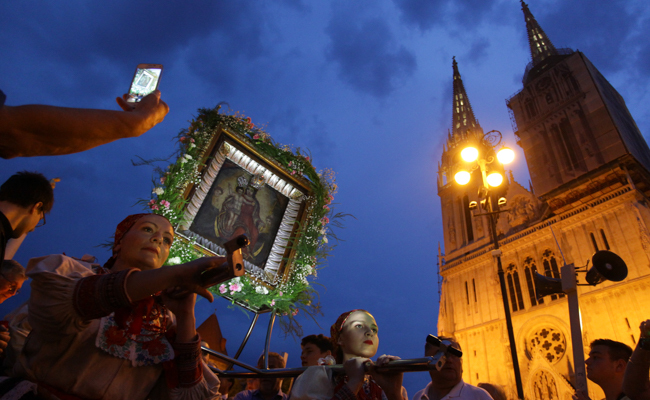 The image of the Virgin and Child in the Stone Gate passage has for centuries been a place where the believers gather or at least stop for a moment with confidence, Cardinal Bozanić said. 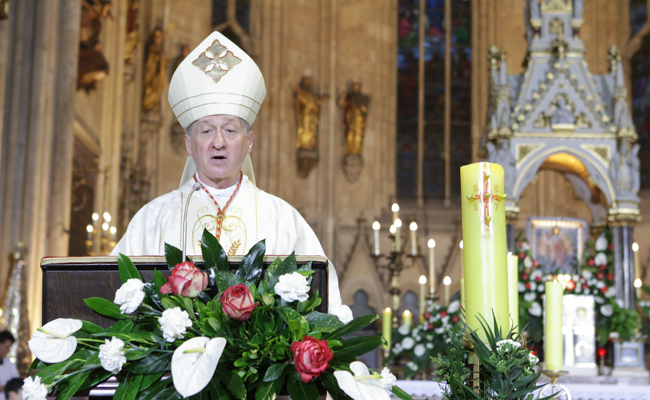 He also welcomed Cardinal Cupich and expressed his joy that the transoceanic distance did not prevent this cardinal of Croatian descent to accept the invitation and share the joy of this celebration with the Croatian people as well as feel the pulse of the nation he comes from and smell the scent of the land where his ancestors were born. At the beginning of his homily Cardinal Cupich said that his heart is deeply touched when he remembers his own roots in the country his grandparents called 'our beautiful homeland’. Reflecting on the Gospel (Luke 1: 39-56), the Cardinal said that it speaks of three things: where Mary teaches, how she teaches and what happens when she teaches. Upon being told that she is to be the Mother of our Saviour and that she is God’s beloved daughter, she hurriedly leaves her home and visits a town in the hill country to be with an elderly married couple who shall become a new family with the birth of their son, instead of staying at home and enjoying her moment of great joy. The message is clear. Where does Mary teach? She teaches in the family, Cardinal Cupich pointed out and added that Mary reminds us that one’s family is the place where the Gospel should be shared and learned first. Sometimes it is easy to forget about this and think of one’s family as a mere social or economic component, especially as families of our time are confronted with a lot of tension and challenges such as unemployment, youth unemployment in particular, as well as breakdown of relationships and changes in society, Cardinal Cupich said. But from the very beginning God had a greater plan for families; the Cardinal said and added that families are not just an economic reality. They are places where we learn about God’s love for us first. As Mary goes to the hills to be with this one family, she teaches the Church that we should work hard to support families in their noble calling. We should especially reach out to those families who are in deepest pain, those families who have to climb the highest mountains, overcome the most difficult challenges, like families where an elderly married couple is expecting a child or ones with single parents or families torn apart by divorce and separation. They are all families in different ways, Cardinal Cupich said. Mary teaches us in a way which encourages us and brings joy to those who hear her voice, Cardinal Cupich said and reminded us that Pope Francis encourages us to serve and teach the same way Mary did. The Pope also encourages us to teach the way Jesus did on the road to Emmaus. The hearts of those two disciples were burning as Jesus taught them, and continued to burn and seek for more even after he left. Like many people of our time who have left the Church, those disciples left their home. Jesus is not harsh to them; he walks with them, makes their hearts burn and gives them a new reason for hope and joy. It is no exaggeration to say that Jesus learnt this teaching method from Mary, whose voice even made a baby leap in his mother’s womb, Cardinal Cupich said. Those are not words of vainglory but understanding that she will make a unique contribution to God’s plan of salvation, the Cardinal said. Just like we as individuals and the entire Church take upon ourselves the role of teaching the way Mary did, we too have to be aware that it is upon us to contribute significantly to God’s plan. Will we live off the past sacrifices of our ancestors who have passed their faith onto us or will we make our own contribution? This is a question for all of us. This is a question for married couples starting their own families. This is a question for parishioners who are invited by God to become involved more in their parish communities and deeds of love. What kind of contribution will our generation make and who will the next generations call blessed? 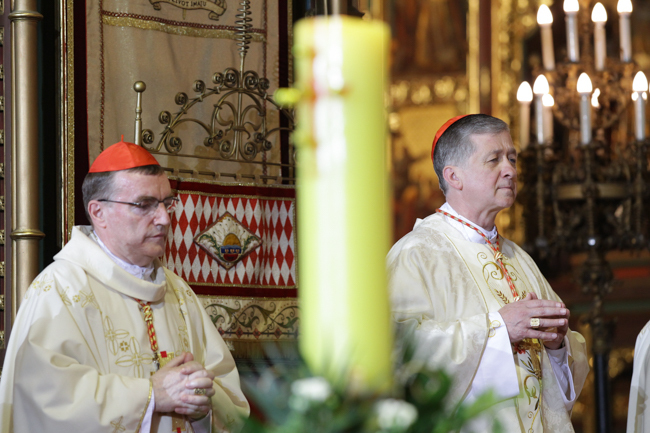 The Cardinal continued his homily by saying that he will visit Omaha, Nebraska at the end of June in order to attend the 100th anniversary of his home parish, which was founded by the Croatian immigrant community. He said that he will remind its new parishioners, majority of which are immigrants from Mexico and Latin America, of heavy sacrifices Croatian immigrants had to make in order to build the parish that is today. I will tell them that the best way to honour their parish’s ancestors is to accept God’s invitation today, so that those who will come after them thank God for their lives, Cardinal Cupich said. 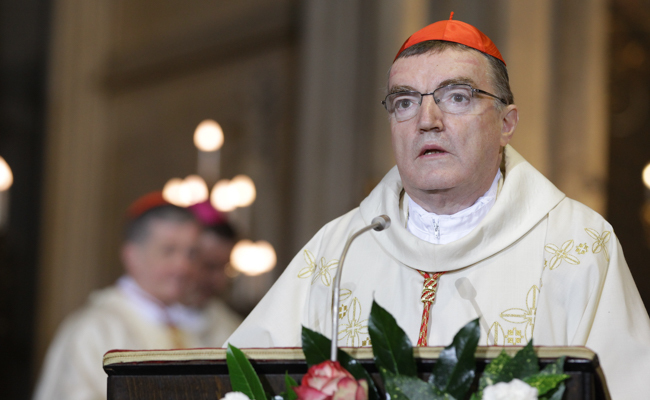 The Cardinal ended his homily by saying that the Zagreb cathedral is where we can encounter an image dear to us all, that of the Blessed Cardinal Alojzije Stepinac, whose canonisation we await in joyous prayer. Stepinac sets an example how the three points aforementioned reflect in the lives of believers. We know that he was committed and close to those in his archdiocese and sensitive to the persecuted, the poor and those in need. All of this arose from accepting his role in God’s plan and staying true to his calling. His sacrifice for others, which arose from the joy of serving others, did not go unnoticed in the eyes of the Croatian believers as many of them carry the image of our Heavenly Mother and Blessed Alojzije wherever they go, as well as treasure in their homes, Cardinal Cupich concluded. 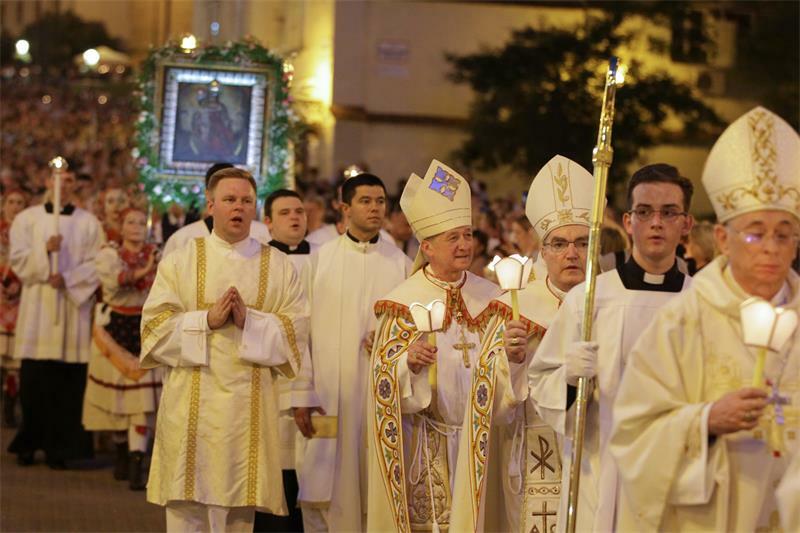 The celebration of the Feast of Our Lady of the Stone Gate ended with a procession from the Zagreb cathedral to the Stone Gate where Cardinal Bozanić said the prayer of consecration and dedication and Cardinal Cupich imparted a final blessing. After the welcoming speech Cardinal Bozanić presented the Archbishop of Chicago and Cardinal Cupich with a bronze sculptural relief of Our Lady of the Stone Gate, the work of academic sculptor Tomislav Kršnjavi, as a sign of gratitude and lasting memory of their encounter. Alongside Cardinal Bozanić, the Metropolitan Archbishop of Rijeka Msgr. Ivan Devčić, the Metropolitan Archbishop of Đakovo and Osijek Msgr. Đuro Hranić, the Archbishop of Banja Luka Msgr. Franjo Komarica, the bishop of Varaždin Msgr. Josip Mrzljak, the bishop of Sisak Msgr. Vlado Košić, the eparch of the Greek Catholic Eparchy of Križevci Msgr. Nikola Kekić, the bishop of Bjelovar and Križevci Msgr. Vjekoslav Huzjak, the bishop of Dubrovnik Msgr. Mate Uzinić, Military ordinary of the Republic of Croatia Msgr. Jure Bogdan, the bishop of Gospić and Senj Msgr. Zdenko Križić, Military ordinary emeritus Msgr. 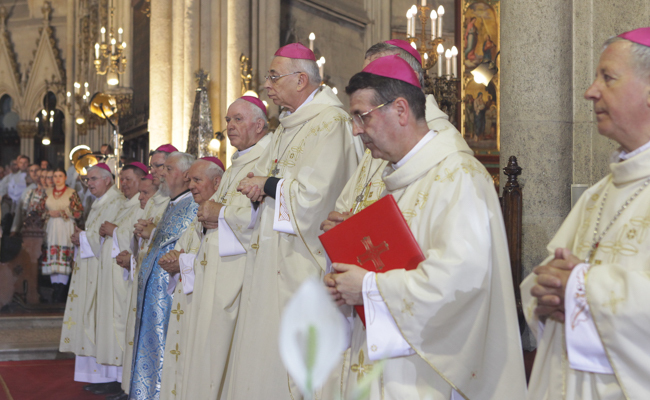 Juraj Jezerinac, auxiliary bishops to the Archbishop of Zagreb Msgr. Ivan Šaško and Msgr. Mijo Gorski, auxiliary bishop emeritus to the Archbishop of Zagreb Msgr. Valentin Pozaić, First Secretary at the Apostolic Nunciature Msgr. Janusz Blachowiak, Secretary General of the CBC Hon. 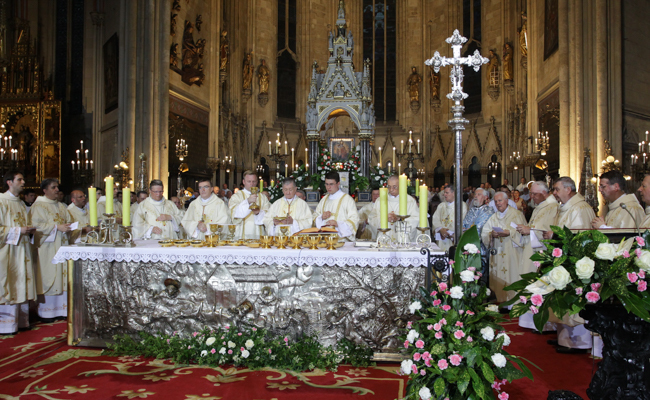 Petar Palić, fathers provincials and a hundred priests of the Archdiocese of Zagreb concelebrated the Holy Mass. 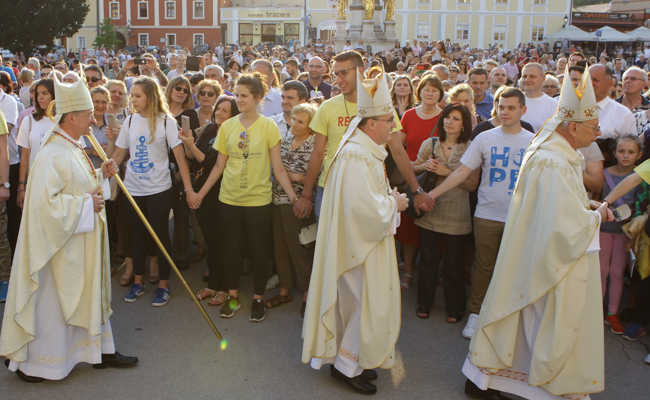 Mayor Milan Bandić, representatives of the city government, as well as the representatives of numerous citizens’ associations from the fire brigade to the veterans’ associations were present at the Holy Mass. The Zagreb Cathedral choir animated the Holy Mass under the baton of Maestro Miroslav Martinjak.